Press Conference Oct. 24, New York: Terrorism & Tea Party: Who’s Hiding What in NYC Mayoral Contest? You are here: Home / We are Gulag Bound / *Resisters' Log* / Press Conference Oct. 24, New York: Terrorism & Tea Party: Who’s Hiding What in NYC Mayoral Contest? Trevor Loudon will be among the speakers at this event. Terrorism and the Tea Party: Who’s Hiding What in the NYC Mayoral Contest? An October 24 press conference in New York City will ask whether Democratic mayoral candidate Bill de Blasio’s ties to anti-American terrorists pose more of a threat to public safety than the Tea Party backers of Republican candidate Joe Lohta. The event is open to the public and the press. 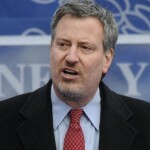 Those connections include de Blasio’s leadership role in the Nicaraguan Solidarity Network, a communist front organization, and his comrades in the Communist Nicaraguan Sandinista movement, who were praised by Libya’s lunatic leader Moammar Gaddafi for having the will to “fight America on its own ground” and promised a “revolution beyond our borders” in Nicaragua. The Sandinistas were backed by the Soviet Union and Castro’s Cuba and fought in the Middle East with the PLO. In 2012, Sandinista leader and Nicaraguan President Daniel Ortega hosted Iranian President Mahmoud Ahmadinejad as a guest of honor. These matters are far more important than whether de Blasio would bike to work and what he thinks is the best pizza in New York City, topics recently featured in the New York media. On the other hand, the New York Post has run several follow-up stories about the candidate’s controversial foreign connections and is now under attack by de Blasio’s former comrades in the Nicaraguan Solidarity Network. “The real questions,” Kincaid said, “are what more and what else is de Blasio hiding?” Although some coverage of de Blasio’s ties to anti-American terrorists in Central America has emerged in the press, Kincaid said his event will encourage the media to dig deeper because of the need to protect public safety in New York City. ASI is an educational organization with a more than ten year track record of exposing extremist groups and threats to the U.S. The group exposed Barack Obama’s communist ties in 2008, including the fact that his childhood mentor growing up in Hawaii was Communist Party propagandist Frank Marshall Davis. At the event, a series of speakers will attempt to unlock the secrets behind de Blasio’s mysterious trips to Cuba and Nicaragua in the 1980s and ‘90s and his prediction that radical Islam will become a “dominant force” in politics. Joe Connor, co-author of the book The New Founders, whose father Frank was murdered in the Fraunces Tavern bombing in New York City, carried out by the Cuban-backed Puerto Rican terrorist group, the FALN. Connor, who is also a 9/11 World Trade Center eyewitness and family member and Tea Party leader, will discuss what de Blasio’s travel to Cuba on a “honeymoon” means to him and what it should mean to all New Yorkers. Pamela Gellar of the American Freedom Defense Initiative on Arab/Muslim terror threats to New York City and the need to support the New York City Police Department in the face of political efforts to dismantle or restrict it. Trevor Loudon, author of The Enemies Within, on de Blasio’s commitment to “democratic socialism” and the significance of de Blasio’s work for David Dinkins, the former New York City mayor who was closely associated with the Democratic Socialists of America. Cliff Kincaid, veteran journalist and media critic, on the communist origins of the Nicaraguan Solidarity Network, which was organized by the Soviet-linked U.S. Peace Council, and its subversive sister organization, the Committee in Solidarity with the People of El Salvador. De Blasio, the frontrunner in the New York City mayoral race, says he is “proud” of his work for the Sandinistas and has not disavowed his previous statements in support of “liberation theology” and “democratic socialism.” He has praised the Sandinistas’ “literacy program,” which was based on a Soviet model and involved an effort to place courses on Marxist-Leninist theory in the Catholic school curriculum.